Asbestosis is a type of pulmonary fibrosis that typically develops after five or more years of regular exposure to airborne asbestos dust. Inhaled asbestos fibers cause scar tissue to develop in the lungs, making it progressively more difficult to breathe. Asbestosis is caused by inhaling microscopic asbestos fibers. In most cases, the disease develops after asbestos has accumulated in the lungs for many years. Asbestos is a naturally occurring mineral American industries mined and integrated into a wide variety of products until largely phasing it out in the 1980s. Working with asbestos produces dust in the form of extremely thin, sharp fibers the human body cannot dissolve. Asbestosis is a type of pulmonary fibrosis caused by asbestos dust. Most hazardous asbestos exposure occurs at worksites. Symptoms often take 20 to 30 years to develop after exposure. Asbestosis has the same cause as asbestos-related cancer. When asbestos fibers become lodged in the lungs, they may eventually cause a buildup of scar tissue as the body’s immune system tries to expel them. The scar tissue stiffens the lungs, making it harder for the lungs to fill with air and provide oxygen to the body. The general term for lung disease caused by scarring is “pulmonary fibrosis.” There are many risk factors for pulmonary fibrosis, and in most cases doctors are not able to determine a specific cause. If a patient with pulmonary fibrosis has a history of asbestos exposure, however, an asbestosis diagnosis may be appropriate. Research indicates the combination of smoking and asbestos exposure increases the risk of asbestosis. For example, in a study of 1,479 asbestos-exposed workers in Barcelona, Spain, those who smoked showed significantly higher incidences of asbestosis than nonsmokers. As with all asbestos-related diseases, occupational asbestos exposure is the primary cause of asbestosis. Most cases of asbestosis in the United States are traced back to working in occupations such as mining, construction, shipbuilding and U.S. Navy service before the 1970s, when the government began to enforce asbestos safety regulations. Family members of asbestos industry workers are also at risk through secondhand exposure, and environmental exposure is a risk factor for people who lived near asbestos mines or processing facilities. Asbestos exposure risks remain for workers who repair or demolish asbestos products in old buildings. People living or working near contaminated sites may also suffer exposure if proper abatement procedures are not followed or asbestos-containing materials break down due to wear and tear. Asbestos industry pioneer Henry Ward Johns, who founded the precursor of the Johns Manville Corporation in 1858, died of what was then called “dust phthisis pneumonitis,” now believed to have been asbestosis. The first official asbestosis case was diagnosed in 1899. The patient was the only survivor of 10 men who had worked in the carding room of an asbestos factory, where raw asbestos fibers were cleaned and separated. By 1918, the causal relationship between exposure and asbestosis was so strong the Prudential Insurance Company refused to issue life insurance policies to asbestos workers because of their early mortality. 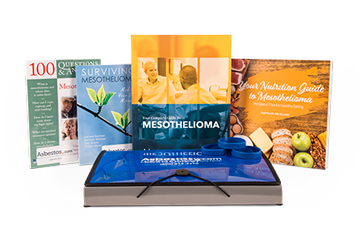 Get a Free Mesothelioma Guide Free information, books, wristbands and more for patients and caregivers. Asbestosis has a long latency period, which means the disease usually does not develop until years after the asbestos exposure that caused it. In most cases, symptoms of asbestosis take 20 to 30 years to present from the time someone is initially exposed to asbestos. The latency period depends on the duration and intensity of exposure. For people who suffered heavier exposure, such as asbestos miners and insulation workers, the latency period typically lies between 12 and 20 years, though even shorter latency periods are possible. In one study, 27 percent of mill workers developed asbestosis after only five to nine years of heavy exposure. For people who suffered lower doses of exposure, on the other hand, the latency period may be longer than 30 years. 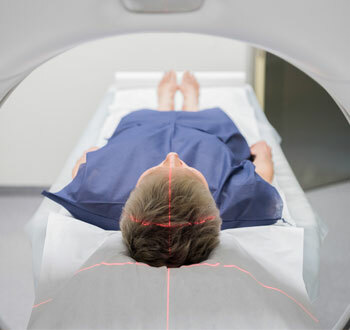 Imaging scans and other clinical testing can detect signs of asbestosis before major symptoms arise. If you have been exposed to asbestos and begin to feel out of breath on occasion, make sure to get checked out by a doctor with experience in detecting asbestos-related illnesses. Being diagnosed with asbestosis is a significant risk factor for more serious asbestos-related diseases such as pleural mesothelioma and lung cancer. Asbestosis and pleural mesothelioma have the same cause but different latency periods, so it is common for a patient to develop asbestosis many years before developing mesothelioma. Because cancer is easiest to treat when it is caught in an early stage, patients with asbestosis should seek regular cancer screening in addition to asbestosis treatment. National Heart, Lung, and Blood Institute. (2011, September 20). How the Lungs Work. Craighead, J., and Gibbs, A. (2008). Asbestos and Its Diseases. New York: Oxford University Press. Icon Health Publications. (2004). Asbestosis: A Medical Dictionary, Bibliography, and Annotated Research Guide to Internet References. San Diego: Icon Health Publications. American Lung Association. (n.d.). Asbestosis Symptoms, Causes, and Risk Factors. Ferreira, L. (n.d.). Pulmonary Fibrosis Causes. Mayo Clinic Staff. (n.d.). Asbestosis.